Thank you to those of you who were able to take part in the walk. We were lucky with the weather and as always the plan evolved and the conversation led us as we walked! My lasting impression of this walk was the sense of loss which runs throughout The Waste Land. 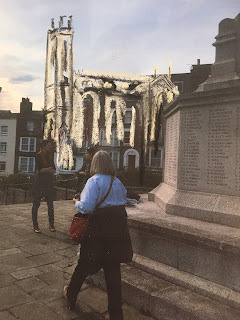 Life's futility and despair as represented by the names of all those people from Margate who lost their lives in WW1 and subsequent wars ,including the Falklands, seemed very present in that space at the War Memorial. Eliot's despair of modern society found its voice in a few empty whisky bottles, bits of rubbish on the memorial and the site's legacy of a bombed church knocked down and replaced by a car park. "You! hypocrite lecteur - mon sembable, - mon frere!" Hope you can make it to the next walk, which is part of the Chelsea Fringe, on May 25th. More details to follow. Meet at the Nayland Rock Shelter 2pm. I'd like to link this walk to the theme of commemoration and war. Both the bombing in Belgium and then Pakistan were events that brought TS Eliot's reflections on death, waste and loss into the present. I also read an article about migration "The long walk to nowhere..." which made me reflect on how the act of walking takes on a different meaning. April is indeed a strange month, with the promise of sunny days and yet still a winter chill in the air and cold showers. It seems to embody hope and loss as is so eloquently put in the quote from T.S. Eliot's The Waste Land.